I have had two periods in my life where the music of Billy Joel was front and center. First, as a small child, maybe three or four, every night when I went to bed I made my mom put a certain record on, and that record was Billy Joel’s 52nd Street. And then, as a senior in high school, our marching band show for the year was The Music of Billy Joel. So when I saw this book, I jumped at the chance to read it. First, let me give you some information on the book. Keep scrolling to the end to see my thoughts. The long-awaited, all-access biography of a music legend. Exhibiting unparallelled intimate knowledge, Schruers chronicles Joel’s rise to the top of the charts, from his working-class origins in Levittown and early days spent in boxing rings and sweaty clubs to his monumental success in the seventies and eighties. He also explores Joel’s creative transformation in the nineties, his dream performance with Paul McCartney at Shea Stadium in 2008, and beyond. 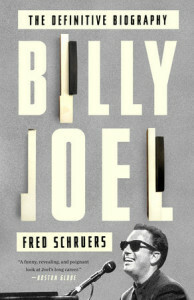 Along the way, Schruers reveals the stories behind all the key events and relationships- including Joel’s high-profile marriages and legal battles- that defined his path to stardom and inspired his signature songs, such as “Piano Man,” “Scenes from an Italian Restaurant,” “New York State of Mind,” and “She’s Always a Woman.” Throughout, he captures the spirit of a restless artist determined to break through by sharing, in his deeply personal lyrics, the dreams and heartbreaks of suburban American life. Comprehensive, vibrantly written, and filled with Joel’s memories and reflections- as well as those of the family, friends, and band members who have formed his inner circle, including Christie Brinkley, Alexa Ray Joel, Jon Small, and Steve Cohen- this is the definitive account of a beloved rock star’s epic American journey. Fred Schruers enjoyed a successful high-profile career as a writer at Rolling Stone, chronicling an impressive body of musicians and actors, including Fleetwood Mac, Bruce Springsteen, Jack Nicholson, Sheryl Crow, Matthew McConaughey, Tom Petty and the Heartbreakers, and Chris Rock. His writing has also appeared in Premiere, Entertainment Weekly, Men’s Journal, GQ, the Los Angeles Times, and Columbia Journalism Review. This book is everything you want in a musician biography, covering everything from Joel’s childhood until the present. Personally, although I enjoyed his music, I didn’t know much about his personal life. I remembered him being married to Christie Brinkley, but knew nothing about his previous marriage and all the problems that occurred during that time frame. And thought Joel has achieved tremendous success, you really feel like he is a regular guy that you could hang out with when you read these interviews. The author also includes information about certain songs, little tidbits that will make you listen to the song in a different way. Schruers also made sure to get interviews with many of the most important people in Joel’s life. 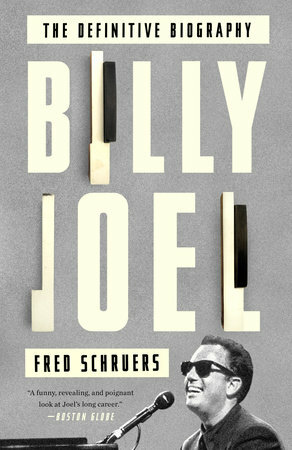 This is a book that any Billy Joel fan should pick up, and would even be an interesting read to fans of music in general.